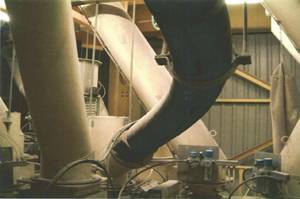 The transportation of dry powders presents complex engineering problems with options largely restricted to airslides and screw conveyors, which involve high initial structural construction and ongoing maintenance and operational costs. Trelleborg has developed a solution that addresses these issues. The Scirocco II powder conveying system is effectively an airslide in the form of a rubber hose. Utilising a flexible form to transport dry powders gives the user some key benefits. The flexibility of rubber allows the system to be easily installed in and around existing plant and equipment which can reduce upfront engineering and installation costs in new systems and in retrofit applications – imagine being able to take your powder around a corner without a transfer station. In addition the Scirocco II system is fully sealed to the environment, meaning that there is nothing that can enter or exit the hose unless you want it to, thereby reducing contamination by moisture and reducing dust escaping to the environment. Scirocco II has a very small cross section allowing you to easily fit it in areas where space is at a premium. This also means that Scirocco II is extremely energy efficient – through a 100mm hose you can transport 60 tons per hour of cement using just 70 litres of air per minute. Efficiencies are gained through the use of innovative air feed lines which carry air along the system with the air then entering the internal area via small choke holes after passing through the airslide felt. 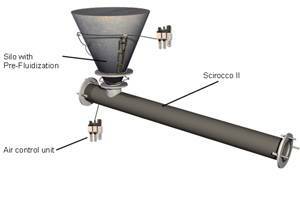 A key to getting the best out of your Scirocco II system is to provide it with pre fluidized material – Trelleborg, having gained considerable experience in the industry, can assist with this aspect of your design. Scirocco II has been tried and proven in plants for over 10 years and there has not been a single case of Scirocco II in the world that has had to be replaced or maintained, meaning that you can truly "install it and forget it". Scirocco II is provided manufactured to your specified length and ready to bolt on with the flanges that are provided, so there is no need for expensive installation contractors. Scirocco II is available in 100mm through to 250mm diameters in lengths up to 10.4 metres. System lengths of up to 300 meters long are possible. Australia Pty Ltd will be in touch as soon as possible.